The Sock Eating Machine (Machina padaledevoro; machina meaning "machine," padale meaning sock, and devoro meaning to devour) is a monster. 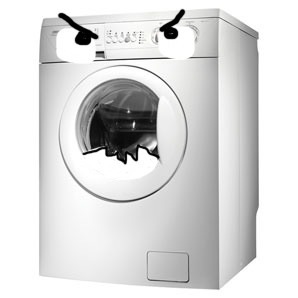 It was an experimental cross-breed between a vending machine and a washing machine. Sadly, the experiment failed due to the loss of everyone's socks. Since socks are the only reason people are smart in the first place, everyone wearing socks near it becomes extremely stupid beyond belief once the machine strips them of their socks. Luckily, after a few well utilized tavern visits, heroes often forget to put their socks back on before resuming a quest, therefore the Sock Eating Machine has no socks to eat. The bad thing is it will begin to eat a hero's feet if it doesn't find socks nearby. To defeat this treacherous beast, a hero must steal someone's socks and shove them in the Sock Eating Machine's mouth. It will stop attacking and go back to it's den where it loves to sleep. HOWEVER extreme caution must be observed when attempting to defeat the Sock Eating Machine in this manner for when fed Original Rockford Red Heel socks it will miraculously begin pooping out Sock Monkey monsters. Has immense power from its 240 watt line. Can eat a lot of socks. Can't tell the difference between good socks and bad socks, so throw it a ragged old one and it will get distracted. Salt. It doesn't want to rust so salt scares it away. When it moves, it creates a colossal racket. Even heroes with poor hearing know its coming.